... NS RPU6 #862 is the 2006, 2nd rebuild of an ALCO RSD-12, originally purchased by the Pennsylvania Railroad in 1958 as PRR #8659. It went through Penn Central (PC) and CONRAIL (CR) where it was chopped and converted into a MT-6 "Slug", before being acquired by Norfolk Southern (NS). This 6 axle, cabless drone is useful as a remote controlled unit for yard work... and particularly on hump jobs, as a traction multiplier when coupled to a power "Slug Master"... in this instance, EMD SD40-2 NS #6205. 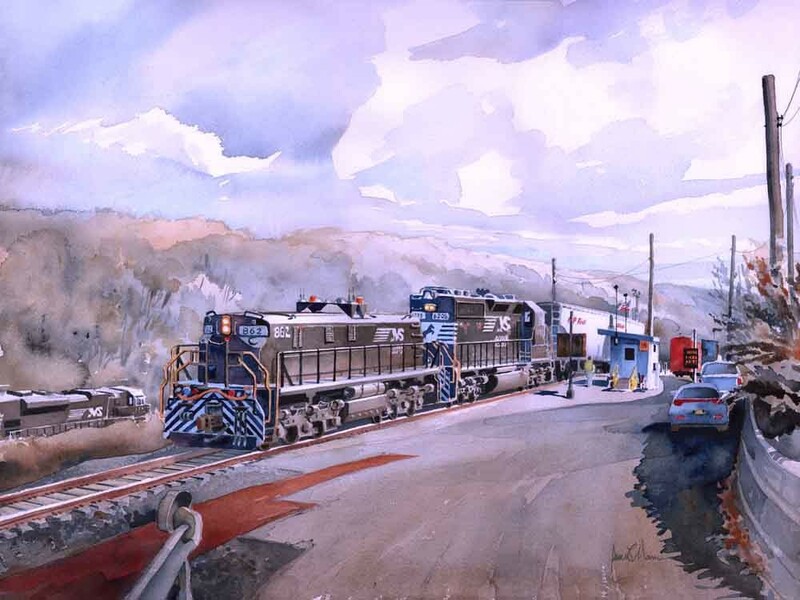 Norfolk Southern's Allentown hump yard is 1 of 44 hump classification yards that still exist in the United States... down from 157 operating humps in the mid-seventies. This classification hump was originally built by the CNJ and then "modernized" with a new switch and retarder system in 1928, and later connected to interchange between what is now the former Central New Jersey (CNJ), Lehigh Valley (LVR) and Reading (RDG) Railroads... all gobbled up by CONRAIL in 1976... who again rebuilt the yard in 1978. There are 29 classification, 6 hump and 7 departure tracks within these yard limits. This hump takes advantage of the natural hillside contour of the land along the Lehigh River, east of Allentown. Norfolk Southern acquired the yard in 1999... this is the action on one brisk day in early February, 2019. ... it's a bit of an ignoble end to a once proud ALCO... but, it lives on... and works for its survival. And if you've never watched the slow motion choreography of gravity being used in the process of sorting incoming rail cars into different outbound blocks of trains... you owe yourself a visit. Every day is hump day. Very interesting and well done watercolor. Thanks for the history. You know a lot about trains. magical work James my mann!! - do like a nice WC! Bewdy! ~;0) VivaChas!